The use of steelmaking slag without chemical modification presents a deleterious effect on cement mechanical properties, due to the expansion caused by the presence of free CaO and MgO in the slag. This work deals with the modification of one basic oxygen furnace (BOF) slag with the objective of making it an appropriate additive in blended cement formulations. Two different modified slags were produced in a pilot-scale metallurgical reactor by mixing additives into 300 kg of remelted BOF slag. The liquid slags were cooled under two conditions: naturally (inside the reactor) and in contact with stainless steel balls. Quantitative X-ray diffraction and energy-dispersive spectroscopy, as well as qualitative scanning electron microscopy and Raman spectroscopy analyses of slag samples, revealed the relationship among cooling conditions and crystalline phases. The modified slags had CaO/SiO2 between 1.8 and 2.0, which is lower than the 3.8 for steelmaking slag. This reduced basicity resulted in the presence of dicalcium silicates (C2S) in higher amounts than in the steelmaking slag. β-Ca2SiO4, α′-Ca2SiO4, bredigite, and RO (FeO–MgO–MnO–CaO solid solution) were detected as major crystalline phases by X-ray diffraction and Raman spectroscopy. Cement samples were produced by mixing 25 wt% of modified steelmaking slag with 75 wt% of ordinary Portland cement, resulting in expansion lower than 0.1% in the autoclave tests and compressive strength higher than 40 MPa after 28 days. 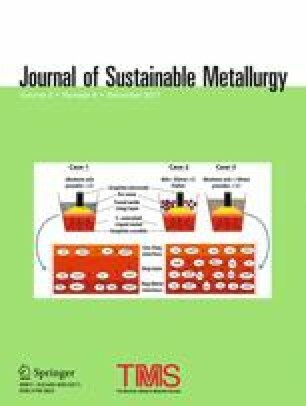 Cement samples produced by adding modified slags presented expansions 5 times lower than that determined for cement samples produced by adding steelmaking slag without any modification. The process indicates potential to be applied as a steelmaking slag treatment. The contributing editor for this article was Il Sohn. The authors gratefully acknowledge the financial support from InterCement and Embrapii.